European Parliament. Plenary Session Week 50, 2013 – European Central Bank annual report for 2012, presented by its President Mario Draghi, pictured here in the foreground (on the right). (EP Audiovisual Services 12/12/2013). Yesterday Mario Draghi, the President of European Central Bank, proposed that the time horizon for the full mutualisation of all bank resolution costs among the EU Banking Union member states, should be cut by half from ten to five years. Also yesterday, in a different occasion, Benoît Cœuré, Member of the Executive Board of the ECB explained how this can be done. He said “We’ve suggested for instance that shortening the timeframe for mutualisation of the single resolution fund would be helpful…you can build up the (resolution) fund within a certain timeframe and have a different timeframe for mutualisation within the fund”. Let’s take one thing at a time. Also yesterday Benoît Cœuré, gave an interview to Thomson Reuters. At a certain point he was asked “What are your expectations as regards the recent proceeding in the European Parliament’s on the Single Resolution Mechanism?” He answered: “The ECB deems the single resolution mechanism a necessary complement to the single supervision mechanism, so it’s very important that an agreement is reached in this parliamentary session…We’ve suggested for instance that shortening the timeframe for mutualisation of the single resolution fund would be helpful…That does not necessarily imply that the contributions of banks would be accelerated, because you can build up the fund within a certain timeframe and have a different timeframe for mutualisation within the fund”. At this point it has to be reminded how those ten years of the ‘frozen’ Banking Union came about. On 18 December the ECOFIN Council, made up by the EU ministers of Finance, agreed that only after ten years, that is towards 2025, the national bank resolution funds would merge into one single truly mutual backstop for the entire Banking Union, able to take care of every bank failure. Until then, every country would pay for the sins of the banks in its own jurisdiction. This solution was backed by Germany and France together. The two countries do not want to share even the smallest part of the cost of winding down a Greek or Italian bank, during the next four to five years. In this way, the ECOFIN has actually postponed the creation of the real Banking Union for a full ten year period, in which time every country will continue baring the responsibility and the cost of eventual recapitalisations or resolutions of any banks that operate in their jurisdiction. The national chapters of the Resolution Fund would start merging their resources after the fifth year and will fully merge only in the tenth year. The European Sting has repeatedly observed that during this ECOFIN meeting Berlin and Paris decided that the cost of winding down a Eurozone bank should be covered almost exclusively with resources of the member state, where the bank is based. The idea is that that the Resolution Fund(s) will be capitalized by a levy paid by all banks. But in the first years of the Banking Union and until the Resolution Fund is fully funded with a round sum of €55 billion, the actual burden of resolving a bank should fall on the national segments of this Resolution Fund(s). If their capital is not enough to cover the cost of winding down a bank, and very predictably it won’t be, other national resources would be tapped, like the Bank Deposit Guarantee schemes which exist in most EU countries. Still if those resources also prove inadequate, then the country’s exchequer and the taxpayers should cover the rest. Germany and France have bitterly denied the option of sharing the cost of recapitalising or resolving a foreign bank in the next four to five years. Berlin and Paris believe that towards 2020 all Eurozone banks will be able to shed their risky placements and stop financing the government deficits of their country, thus dismantling “the infamous bank sovereign nexus”. The interventions of Draghi and Cœuré, come at a critical point of time. Presently, the European Parliament and the Presidency of the Council are at a stalemate. Almost unanimously the legislative has rejected the proposal of the ECOFIN for a ‘nationalised’ and highily ‘politicised’ Banking Union, in which every member state will be almost solely responsible for its own banks. Along those lines the ECOFIN has planned an Intergovernmental Conference, which will decide about the ten year deferment of the full Banking Union. During that time, the Conference will also overlook the gradual merger of the national Resolution Funds into one. Of course, all along this procedure, the Intergovernmental will decide which bank will be resolved or saved and recapitalized and who will pay for that. The Intergovernmental Conference having the value of a common international agreement would be completely outside the EU standard functions, and will be governed exclusively by the representatives of governments. No other EU institution like the Parliament or the Commission would participate in it. 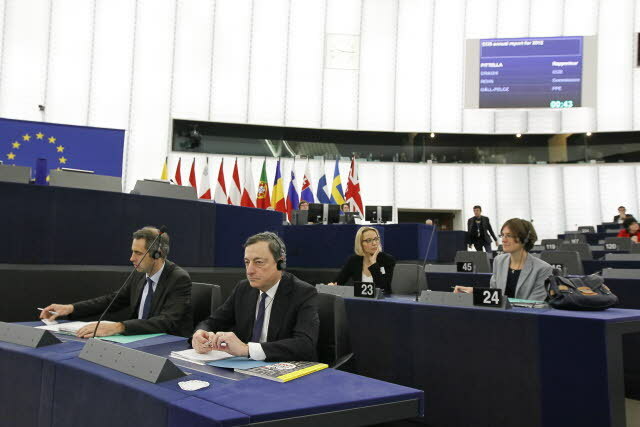 In this way, Germany and France, the two major political and economic powers of Eurozone, by controlling the functions of the Conference, will be able to impose their will on decisions regarding bank resolutions and recapitalisations, despite the fact that the cost will be borne by the relevant member states. All the major political groups of the European Parliament have definitely rejected these dreadful prospects. As a result, the two institutions, the ECOFIN Council and the Parliament, are desperately looking for a way out, given that everybody wants the issue to be resolved in this Parliament, before the May elections. Draghi and the ECB may have offered such a way out by proposing different timeframes for the capitalization of the Resolution Fund(s) and the mutualisation of its obligations. The logic behind is not to burden the banks with double levies towards the Funds’ capital of €55bn and at the same time cut the time needed to make it fully operational by half. However, for that to become real, somebody has to lend money to the Fund(s). This somebody, can be nobody else than the wealthy European Stability Mechanism, the heir of the European Financial Stability Facility.